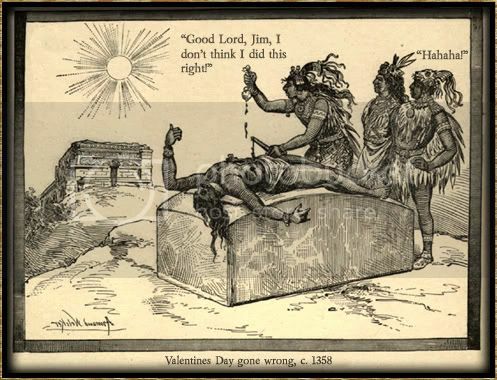 The Lobotomist's Dream: The Lobotomist's Dream Valentines Eve Special! I'm pretty ambivalent towards Valentines Day. On the one hand, it's a terribly over-commercialized holiday which tries to make money from human emotions. On the other hand, it is a good opportunity for couples who have begun to take their relationship for granted to give it a second life. Of course, neither of these apply to me. Oh, I'm sure I'll talk about my relationship status later, but suffice to say, I have no Valentine. So, what's this eligible bachelor to do on such a holiday? Celebrate it in his own way, I suppose. Let's look at my Valentines' Day, shall we? "The heart the beats fastest bleeds first." Not only is this anatomically correct, but it's cynically correct, as well. (It basically means "Those who love the strongest are hurt the easiest," or something like that.) I was quite proud of how quickly I came up with the line, downbeat though it may be. I then signed it, "Regards, Andrew ^_^"
To make the second card, I simply used the rest of the construction paper, which had an upside-down heart cut in it (no kidding). I drew a head on top it, a couple arms on the side, and some shoes on the bottom. I then dubbed my new man "Hearty McWidelegs." On the card, there was a small speech bubble in which Hearty said sullenly, "I have no girlfriend." Oh, Hearty! I then signed the card, "Yours in business, Andrew ^_^"
Neither was popular, but I blame that on the poor quality of materials. If you think this is a joke...well, you're partially right. While it is supposed to be funny, this is actually what I am giving people for their cards. Why, yes, I do have a sick mind, thank you for asking. Moving along, here are some videos I feel are relevant to the holiday. I swear, one of these days I'm going to use that "I am your emperor" line. I think I shave two years off my life whenever I see that video, but I love it nonetheless. But I guess this could be considered pretty romantic for the Neolithic times! Hmm...considering all the things I associate with this holiday, maybe it's no wonder I can't get a Valentine. Ah, well. Enjoy yourselves, you crazy kids! Your Oblivion movie reached out to me, Andrew. I was hooked on its predecessor Morrowind this past summer (ran quick on my computer and sported a cool $7 pricetag). Way to make your readers hate their school responsibilities that supplanted its virtual conquest.